Hi friends! We sent the first email of The 7-day Doubt Diet Friday morning! It includes a short welcome note from me and Chapter 1 from my new book, A Confident Heart. If you signed up and didn't receive the email, see suggestions for how you can fix that at the end of this post. If you want to receive it but haven't signed up yet, enter your information (carefully) in my sidebar under "Doubt Diet Sign-ups". We'll be sending it again, to new sign-ups this weekend. I wanted you to see a vlog (video blog) I recorded with Melissa Taylor, one of my favorite people in the whole wide world, this week. She is also a speaker, writer and servant leader with P31. And she's going to be offering A Confident Heart online Bible study of in September. (More details soon on how you can sign up). This summer, Melissa is shepherding the hearts of 3500 women going through Wendy Blight's book, Hidden Joy in a Dark Corner. I know some of you are part of that special group! This week Melissa is encouraging them to go on The 7-day Doubt Diet with us! 3) Check to see if your firewall is blocking it. Those who signed up with work emails are having the most trouble since it's an unknown source to your networks. 3) If you still can't find it, re-enter your information in the sign up box and very carefully to make sure your email is correct. Typos in emails addresses are keeping people from receiving it. 4) If you do all that, and you still haven't received it by 3pm Sunday, June 26th, email aconfidentheart@gmail.com with your name, state and email address. But please only do that if after you have done 1-3 and allowed time for the system to re-set and re-send. Please join us in praying for the blood of Jesus to cover all things techy, and for the enemy to be thwarted in attempts to keep women from experiencing all that God has for them! I can't wait to share HIS message of hope and Christ-confidence with you!! Hi friends! I'm in the middle of designing and filling the rooms of a new place that I will soon call home -- online. I cannot wait to share my new website with you! I've been dreaming about new decorations and renovations for years. I've longed for a place that reflects more of my personality, my heart, my passions, my messages and my family. But I've been waiting on God's timing. And now it's almost here. That is one of the reasons I've been missing in bloggy world. I still can't wait to tell you about my insane whirlwind trip to Canada where I got to see God move in miraculous ways. It involves a missing passport and working with the US government to get a new one in less than 24 hours! I'll leave you hanging there. For now, I need to get things ready for our little open house. Hoping it will be partially ready for close friends like you next week. We're working on getting at least some of the furniture and wall hangings (ie. content, videos, photos, etc.) moved in this week. I'm also launching The 7-day Doubt Diet and it'd make my heart smile to have a new welcome mat on the porch to greet new friends that will pop over from it. Speaking of the doubt diet, I have some amazing news! I was praying for 3000 sign ups before A Confident Heart. launches in August... As of this morning, and we're just shy of 4,000 people signed up already! My fun, adventurous-faith girlfriend, Lysa TerKeurst, challenged me to start praying for 10,000 and I've accepted her prayer dare! Wouldn't that be so amazing for 10,000 of us to start losing the weight of self-doubt together?? I hope you will one of them! If you're not signed up yet, be sure to sign up in my sidebar today and invite someone to join you, too. Click here for a short pre-written invite to send family and friends. And now for a peak inside my heart: I woke up today feeling like I can't keep up with all that is going on. It wasn't the first time I felt like I don't have what it takes to fulfill my calling as a wife, mom, and woman in ministry. I bet your life feels impossible sometimes, too. And that is why I hopped on here. I wanted to share with you how God encouraged me this morning. I posted a promise that gave me His perspective today on Facebook and wanted to share it with you. Will you choose to live in the security of that promise with me today? Let me know how I can be praying for you, and I will be. I'd treasure your prayers, too. I'd love to stay connected a little more consistently than I can here. So, I'm posting almost daily and sometimes more on Facebook. I'd love to see you there! 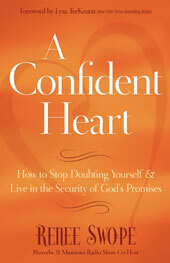 Leslie Mears you have won 3 copies of A Confident Heart when it releases in August! One is for you and two are to give-away! Jodi Escapule you've won my “Getting Up Again” give-away which includes a signed Advanced Copy of my book, A Confident Heart, along with a GoBible® and a copy of the 31-verse promise chart from my book! We need each winner to please send your mailing address to leah.proverbs31@gmail.com by Friday, June 17th. We hope to hear from you! If we don't by then, we'll need to select an alternate winner. Thanks! *Also, our friends at GoBible® are offering a discount and free shipping through June 15th for Father's day and graduation gifts. I don't get any cuts or commissions. I just love listening to my Bible on the go, so that is why I share about them with you! and maturity when we learn from it." In my Proverbs 31 Ministries devotion today, I shared this truth and how God's used it to teach me how to "get up again" when failure threatened to keep me down. I also shared about a fun give-away I have today but before we get to those details, I want to invite those of you who are new to my blog to sign up for my FREE "7-Day Doubt Diet" devotions in my sidebar. These devotions are for friends like you! They include a week's worth of encouragement and practical ways to lose the weight of self-doubt. And they'll also give you a peek inside my book before it releases because they include some of my favorite parts of A Confident Heart. I also wanted to give you some promises that will help us re-define our perspective! As I shared in my devotion, following Jesus is not about avoiding failures and being perfect. It’s about accepting our weaknesses and becoming more dependent on God’s perfect love and power at work in us. When I Say: I don’t know what to do. When I Say: I can’t do it. When I Say: I’m too afraid. When I Say: I can’t forgive myself. I hope you'll print and carry these with you! Why not put a copy on your mirror, in your car and in your purse? Also, I hope you'll enter to win my "Getting Up Again" give-away (a signed advance-release copy of A Confident Heart, a GoBible® to listen to God's Word on the go, and a copy of the 31-verse promise chart from my book.) To enter, just sign up for the doubt diet and invite a friend or two to join you! Invite a Friend, it's easy! Sign up for the doubt diet - it's easy to do in my sidebar. Encourage a friend(s) to join you via email, FB, Twitter, etc. You can use easy invite above. Click on the word "comments" below this post. Let me know your name, that you've signed up for the Doubt Diet and invited friends. To find out if you win, leave your email in your comment, sign up for email updates or follow me on Facebook. I'll announce the winner next Monday. The "7-Day Doubt Diet" releases June 27th. For more details click here. A Confident Heart releases August 1. You can pre-order it here or anywhere you love to buy books. 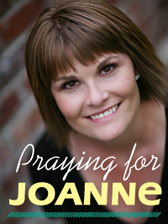 All pre-orders through Proverbs 31 Ministries will be signed by me and book proceeds go back to P31. If you have any problems ordering on our P31 site, you can call our office at 704-849-2270 and they'll be happy to help.